Fish, be it from marine or freshwater origin, has a key role to play in the fight against hunger as it reduces poverty by generating incomes and malnutrition as it provides valuable animal protein and essential micronutrients to vulnerable populations. The Fisheries and Aquaculture Department supports all efforts to promote Blue Growth - with its emphasis on reconciling social and economic development with environmental performance - to all fisheries and aquaculture policies. The Department leads efforts to promote and support implementation of the Code of Conduct for Responsible Fisheries and its related instruments, in addition to providing scientific advice, strategic planning, and training materials. Moreover, it serves as a neutral forum in bringing together relevant actors to discuss issues related to international cooperation and multistakeholder approaches to fisheries and aquaculture management. The Department comprises one Division with six Branches employing more than 200 staff and consultants (organigram), and manages an overall total delivery of USD 45 million per year through approximately 280 fisheries/aquaculture related projects, in close collaboration with the colleagues based in the FAO decentralized offices. The Fishery Policy, Economics and Institutions Branch oversees economic, social, institutional, governance, policy, and management aspects of fisheries and aquaculture, with particular emphasis on improving human well-being, food security and poverty reduction. The Aquaculture Branch is responsible for programmes and activities related to development and management of marine, coastal and inland aquaculture, with a special emphasis on technical, socio-economic and environmental aspects. The Product, Trade and Marketing Branch focuses on the improved post-harvest utilization of fisheries and aquaculture resources and the reduction of food losses along the entire value chain. It develops codes of practice, guidelines and standards related to the safety of products, utilization, marketing and responsible trade. The Statistics and Information Branch is responsible for the collection, compilation, validation, analysis and dissemination of reliable and up-to-date information on all aspects of world fisheries and aquaculture. The Fishing Operations and Technology Branch has primary responsibility to transfer and promote the use of appropriate technologies, infrastructure, equipment and practices dealing with the operation of marine and inland fisheries. The Marine and Inland Fisheries Branch focuses on the management and conservation of fishery resources, including mainstreaming biodiversity and ecosystem concerns in fisheries management, with special attention paid to threatened species and vulnerable habitats. The FISHCODE serves as the principal instrument for project cycle management and resource mobilization in the Fisheries and Aquaculture Department of FAO. Develop methodology, assess and monitor the state of wild resources and elaborate resources management advice. Monitor and advise on the development and management of aquaculture. Collect, analyze and disseminate information on the sector (capture and aquaculture production, trade, consumption, prices, fleet, employment). Provide socio-economic analysis of fisheries and aquaculture and assist in the elaboration of development and management policies and strategies and institutions. 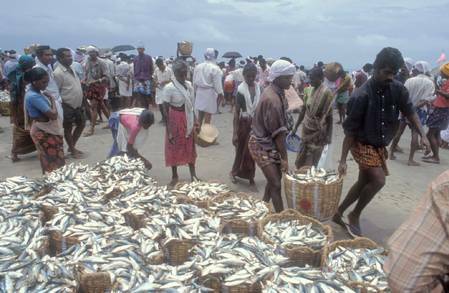 Monitor and advise on technology development, fish processing, food safety and trade. Ensure skilled resourcing and effective delivery of FAO's Strategic Objectives in the field of marine and inland capture fisheries, aquaculture and food systems, and provide leadership to the FAO Blue Growth Initiative. Support and assist a network of regional fishery commissions and promote aquaculture networks.